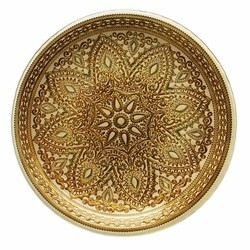 ChargeIt by Jay Divine Gold Charger Plate 13"
Home > Products > ChargeIt by Jay Divine Gold Charger Plate 13"
Create an eye-catching impression with the ChargeIt by Jay Divine Gold Charger Plate 13". Boasting an intricate gold oriental pattern, this glamorous charger plate adds classic elegance to wedding receptions and lavish parties. As beautiful as it is exceptionally durable, this premium quality solid glass charger plate has a delicate appearance while being strong enough to withstand day to day use. Perfect for presenting multi-course meals, this charger plate not only complements any upscale table setting but also protects against spills and mess that might otherwise stain your tablecloth.